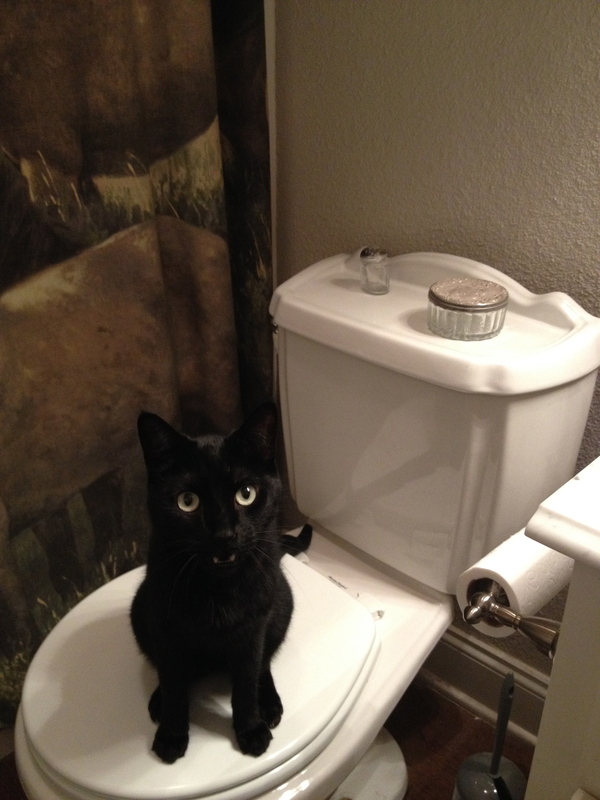 Bear, aka the toilet cat. Looks like he owns the joint, doesn’t it? Bear is one of Shadow’s fur-kids and was born here on the farm. (Read more about how we ended up with a clowder of cats.) The skinniest of all the kiddos, for the longest time he was also the shyest. Darting from one end of the barndiminium to the other, you’d find him hiding in closets and laundry baskets. I was never really sure why he was so shy; he had been petted and loved on since he was just a few hours old. But nevertheless, that was the situation for the first three years of his little life, which is when he developed his penchant for bathrooms. For whatever reason, when Bear would hear you enter the bathroom he’d come running. Until just recently, it was the one time he wanted your attention. During the morning-getting-ready time, he’d fly into the bathroom, weaving between your legs and dancing across sinks and cabinets, and yes even the toilet. It was the strangest phenomenon to us. He loved you in the bathroom, but not so much anywhere else. Most of all he loved it when you were captive, if you catch my drift. In fact, at nighttime we would put Shadow and her kitties up in their kitty condo so we could all get a good night’s rest. But first, we’d have to wrangle them. For Shadow and her other kids, food bowls and dinner time did the trick. Not so much for Bear. Cowboy would sigh and say, “Go get your cat.” (And realize around here, “your cat” is generally not nearly descriptive enough.) Anyway, I would dutifully pad to the bathroom fully clothed in my pajamas and just sit on a closed-lid toilet as if I was having a seat in the living room rocking chair. And sure enough, within seconds Bear would shoot around the corner and land at my feet. We did this night in and night out. 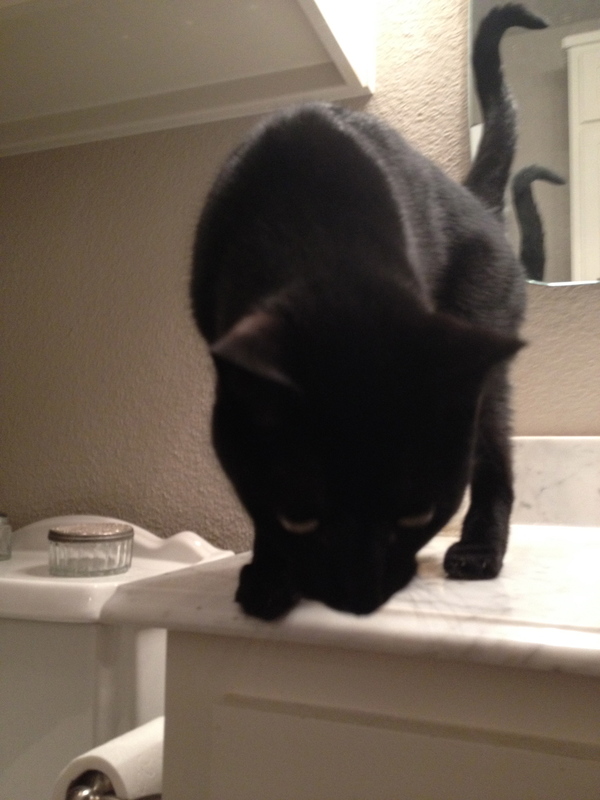 Bear hanging out on the bathroom counter – waiting to advise on eye shadow colors. Six months ago, something finally shook up his little brain, and he has decided that he would like to be friends outside of the porceline throne room. Go figure. However, admittedly it’s still his favorite room. He’s now ventured on to playing hide-and-seek with Shadow using the tub and the shower curtain. Fur-kid problems, I tell you! But never fear, his favorite time to be a pest, er um a delight, is still morning-getting-ready time. I now even have to apply makeup standing away from the countertop, as he thinks he’s my makeup artist du jour. Ever try putting on eyeliner with a cat at your elbow? I don’t recommend it. I guess it’s a good thing, this farmgirl limits the makeup to going out and special occasions. Why not just push him off the counter, you ask? Because the cat has springs for feet and that becomes and even bigger game. Bear is nothing if not persistent, and bless his little persistent and consistent heart, he will always be our toilet cat.